Of all the new albums I received from 2L Recordings right before the Consumer Electronic Show, this was the one title I knew I could stick in the CD player, push play and let it run all the way through without chasing too many attendees out of the room. That's certainly not a slam on 2L and their penchant for taking on adventurous musical projects. It's more of a general feeling I have that classical music is indeed dying in the United States, and has been for quite some time. (I first mentioned this almost exactly nine years ago, here.) Every time I exhibit at a trade show and start playing classical music, the crowd gets restless. Sometimes they leave the room and look for someone who's playing Krall or Barber of something more audiophile-approved. Which is crazy, of course. Remember when J. Gordon Holt proclaimed that the only type of music that audiophiles should use to evaluate a hi-fi system's merits was classical? That wasn't too long ago, was it? But now it seems that every time I play classical music at a trade show for an extended amount of time, I eventually find myself in an empty room. So why, you might ask, would even even bring a classical recording to an audio show? Well, if I don't, someone will eventually come into my room and ask to hear a classical piece and if I don't have it, I look kinda stupid. So what makes 2L Recordings' new SACD/CD hybrid disc, Under the Wing of the Rock, so special and so impervious to these aforementioned trends? I can't really come up with a strong, cogent reason. All I can do is hit play and allow you to hear deep, deep into the sound of a small string orchestra and, in particular, know what it would sound like if a viola was played right in front of you by a real live human being. The first few minutes of Under the Wing of the Rock should make you stop talking. It should make you sit down in a chair in front of the speakers. 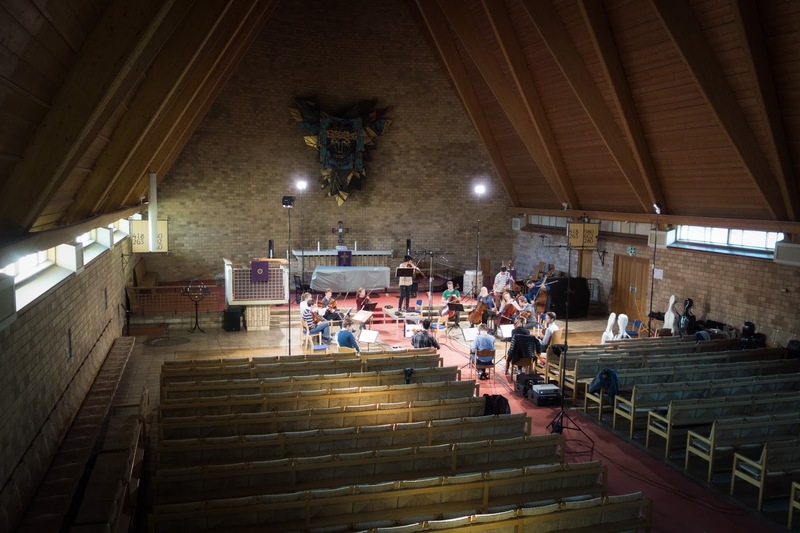 It should make you forget about all those female singers that somehow have replaced the sound of a classical ensemble as THE way to judge an audio system's strengths. This collection of British and Norwegian music for an assortment of small string ensembles, all composed within the last 70 years, immediately captures the listener's attention on several fronts. First, there's that unmistakable feeling that this is what it sounded like in that old Norwegian church when 2L's Morten Lindberg was scrambling around trying to capture the essence of this intriguing music. Second, the variety and scope and the dynamic power of these sounds will surprise you--this is a far cry from your parents' massed string Shaded Dogs. Finally, and I may not have delivered this impression thoroughly yet, this music sounds absolutely gorgeous and melodic and unusually keen when it comes to evoking specific imagery and letting you trail off into vivid daydreams. Even though I started off by saying that I could throw this CD in the player and just let it run, I may have to abridge that somewhat. 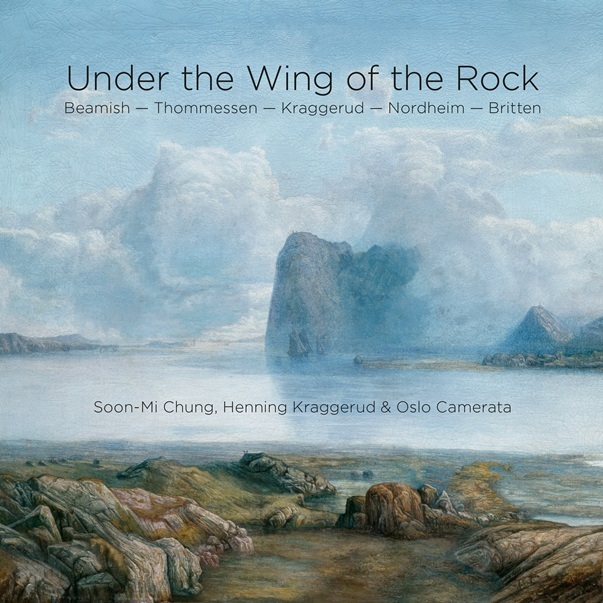 The middle four pieces, composed by contemporary Norwegian composers Henning Kraggerud, Arne Nordheim and Olav Anton Thommessen, all possess that angular modern sensibility you find in classical music composed since 1950, the date of the oldest piece in this album. Dissonance in classical pieces can be a real litmus test for how deeply you're interested in how music has evolved historically. 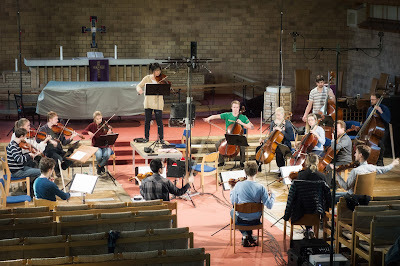 But the pieces that mark the beginning and end of this CD, Sally Beamish' title piece and Benjamin Britten's Lachrymae are beautiful bookends, thrilling pieces that really dig deep into the way musicians interact with both their instruments and the other performers that share the stage. (That is especially true of featured violist Soon-Mi Chung, whose exquisite playing clearly defines the tonal differences between violas and violins.) In other words, Under the Wing of the Rock is the answer when the question is "Can you play a really nice recording of string instruments?" I'd be far more excited to honor that request than to put on yet another female voice. Under the Wing of the Rock is now a permanent fixture for me at trade shows. Les Davis, who has created the constrained layer damping (CLD) material I talked about after my trip from Australia, has just sent more more prototypes of his new footers to try out. As you can see from the photos, Les has been playing around with colors, patterns and even thicknesses. His latest assortment includes CLD footers of different thicknesses--three layers, four layers, five layers and even six layers. Now I have to determine if the sonic improvements can be increased even more by adding layers of CLD material. We do know that the overall sound of the system improves if you keep adding footers to all of the components. Back in Sydney, we started off with four footers under the feet of the CD player. Then we added more material under the amplifiers we used (Tara Labs, Einstein and REDGUM). Finally, we added CLD footers between the Brigadiers Audio BA2 monitors. With each addition, the sound improved incrementally. The CLD footers made our test system sound fuller and with a greater wealth of detail. We all made the comment that "more music flowed through" with the footers in place--I've since read in an equipment review that the flowing music description has become a huge cliche, so I will refrain from using it in the future. But you get the idea, I hope. These additional tests will help Les to determine the finished product. Will he offer the CLD footers in different thicknesses, at a proportional retail price? I'm using a very resolving system to determine that--the new flagship Unison Research Unico 150 integrated amplifier, the equally new Unison Research Unico CD Due transport/DAC, my Trenner & Friedl ART monitor speakers, the PureAudio Vinyl phono preamplifier and my Unison Research Giro turntable/arm mated with a Transfiguration Axia cartridge. All cables and power management are from Furutech. I've settled on this system over the last few weeks because it is unusually resolving and allows me to hear deep into recordings (another audio cliche, by the way). The different colors and patterns are just Les having fun. I had one person at CES ask me if the footers would be available in different colors and patterns, and Les told me he could do anything the customer wanted. He's still considering how to finish the footers, but he's already determined that wood and metal sandwiches may look attractive, but they lessen the impact. So he might be close to a finished product for now--he's experimenting with laser cutting so that the edges are neat and professional. That kind of makes Les' footers a no-BS kind of audio accessory, I think--you're not paying for anything that doesn't affect the sound. Besides, when you put the footers under amps and digital sources, you can't see them. Plus, and this is an important point, keeping it simple allows Les to sell them at a very, very reasonable price. So this will be a tweak for the masses, something just about everyone can try! My latest installment of The Smoking Jacket is now online at Part-Time Audiophile. In this article, I talk about long, thin cigars like lanceros and panatelas and how to get more enjoyment out of them. In last week's review of 2L Recordings' Mezzotints, I mentioned that I had a handful of albums in for review that might be a little too avant-garde to play at trade shows. That's too bad, because I've had so many musical epiphanies while listening to music that's "outside of the box." I think about musical pieces I've heard over the years such as Kevin Volan's White Man Sleeps or Scott Walker's The Drift or heck, even my favorite rock album of all time, Pixies' Doolittle, that have changed my tastes in profound ways because they were so challenging to me at the time. When I first received Anatomy of Sound's Song Circus right before the holidays and stuck it in my CD player, I instantly thought to myself that this was NOT something I could bring to CES and play in my room--unless it was the end of the day, of course, and I wanted to clear the room and head back to the hotel. This collection of experimental pieces for five voices and "electronics" is definitely not in the wheel house of your average grumpy old audiophile, but if you can power through your preconceptions about songs and melodies you might find that Song Circus will evoke feelings and emotions that are as rewarding as they are unsettling. "Through minutiae explorations into the very microlevels of sound anatomy, through vocal investigations as well as the activation of spatial premises and the discovery of timbral qualities of objects, Song Circus masters an unusual audial vocabulary that expands the idea of what music can be." That's the brief description of this album on the liner notes, and it pretty much hits the nail on the head in a paradoxically vague way. What you'll notice first is the presence of five female voices making random sounds that dance around our definition of singing. Noises, pops, whoops and even sirens abound in this open, airy soundscape, defining spaces and daring you to hear ever closer. Then you'll notice the low rumblings in the distance, drone variations and sudden squawks that might make you jump at times--especially if you're tempted to lean forward to catch all of the tiny little details. The overall impression is sort of a mix between ambient, Bjork and "Revolution No.9," despite the fact that these sounds are all captured organically and naturally by Morten Lindberg's microphones. You might be tempted to think that so much of Song Circus is a studio creation, but you'd be missing the point. 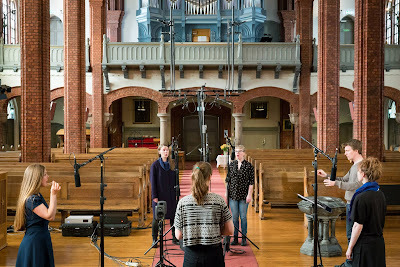 While the first part of the album, a 12-part suite titled "Landscape and Figures," does unite the five improvised female voices with Ruben Sverra Gjertsen's sounds, which have been channeled through either eight or sixteen sound channels--Morten Lindberg's new Immersive Sound technologies, which takes surround sound to a new level of complexity, is the perfect partner for this composition--attention must be paid to how those sounds interact with the singers. This is, to a certain extent, reminiscent of the idea that an electric guitar is actually an acoustic instrument since the tonal qualities are dependent on how the guitar amp interacts with the room. Once you get past that distinction, the second piece makes more sense. "Persepone," Ole-Henrik Moe's piece for five voices and wine glasses, is a purely acoustic exercise that focuses on "vocal sound, dynamics and microtonality." It's purer and more aesthetically soothing than "Landscapes and Figures," and yet it gives you more context to enjoy the album as a whole. So no, you will not be humming these pieces to yourself after listening in your car on the way to work. This is brain music, to put it succinctly, something to help you define your own expectations when it comes to your musical sensibilities. 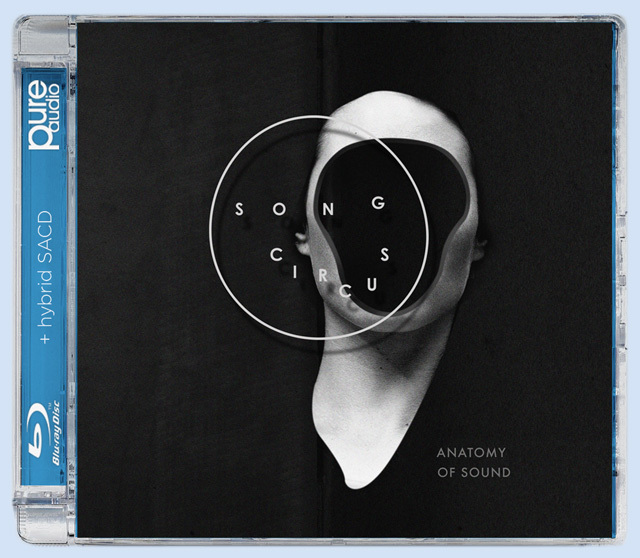 Song Circus will either challenge you and expand your horizons, or it will make you head for the exits. But I can't think of a more informative recording in my entire music collection. If you patiently listen to Song Circus in its entirety, you'll emerge from the experience knowing more about your sound system and how it interacts with your listening room. You'll also know more about your brain, and how it interacts with new information. As much as I enjoyed this album, and the way it revealed things I've never heard before, I'm even more excited about the other avant-garde recording I received from 2L. That one left me in complete awe, so check back in a couple of weeks! My latest Vinyl Anachronist column is now online at Perfect Sound Forever. In this installment, I talk about the ultimate analog format, reel-to-reel tapes, which is making a serious comeback right now. You can read it here: http://www.furious.com/perfect/vinyl107.html.